Mapei – perhaps the most famous team to have bounced their tires across the roughly hewn stones of the Arenberg and where Sportful’s rich history with Paris Roubaix starts. Despite (or because of) his disappointment he returned in 1994, again it wasn’t the result he hoped for, settling for 3rd place behind Belgian Andrei Tchmil and Italian Fabio Bataldo. Time to change the game. 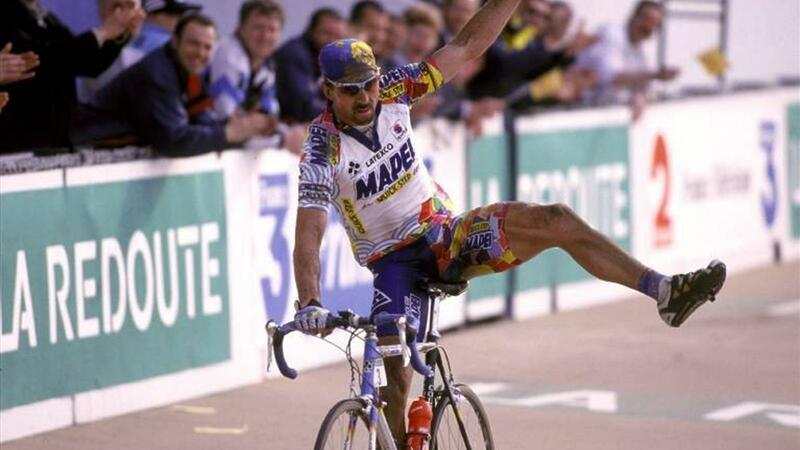 At the start line of the ’95 race he was a picture of focus and determination, his Mapei team standing out in the latest kit from new sponsors Sportful (Mapei’s clothing partner from 1995 – 2001). On the pave he made his mark, building speed through each of the cobbled sectors, floating over the rough stones like they weren’t there, he continued to build his lead putting 2 minutes into the chase group which was being controlled by another Roubaix legend, Ballerini’s teammate, Johan Museeuw. His teammate Museeuw’s hard work also paid off that day as he was rewarded with the 3rd step on the podium. 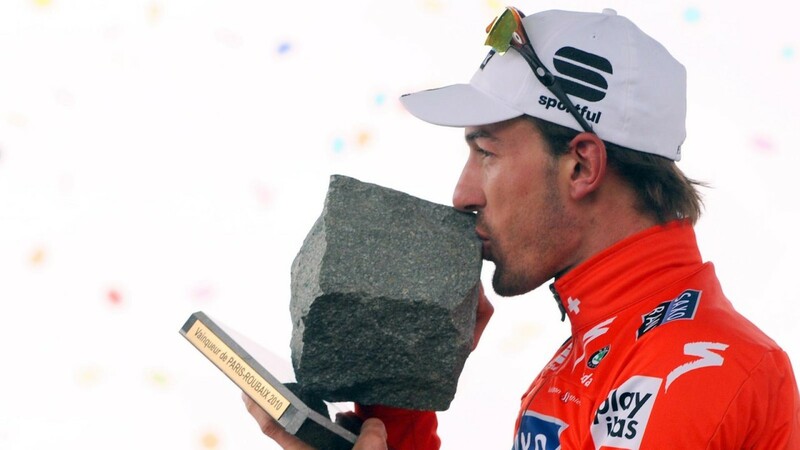 Sportful had it’s first Paris Roubaix victory. 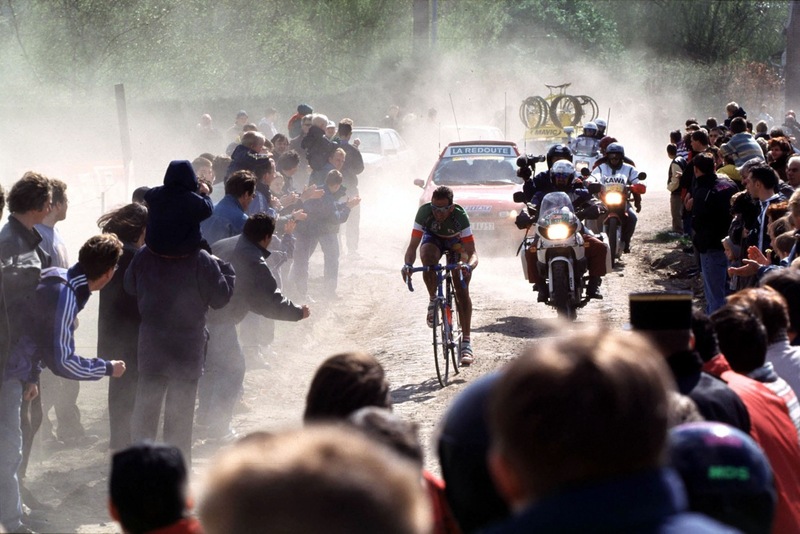 Again dry, sunny and dusty – 1996 turned out to be an even greater reward for both Museeuw and Mapei. The team rode TTT style 86km from the finish over the 11 remaining sectors of cobbles, putting over 2 minutes into the rest of the peloton, entering the velodrome together and crossed the line in an order agreed 15km before the finish – Museeuw, Gianluca Bortolami then Andrea Tafi. Teammate Ballerini was in the group of riders next to cross the line, having dealt with 3 punctures in the last 12km. it was an impressive show of force and one which cemented Mapei’s status as a ‘superteam’. 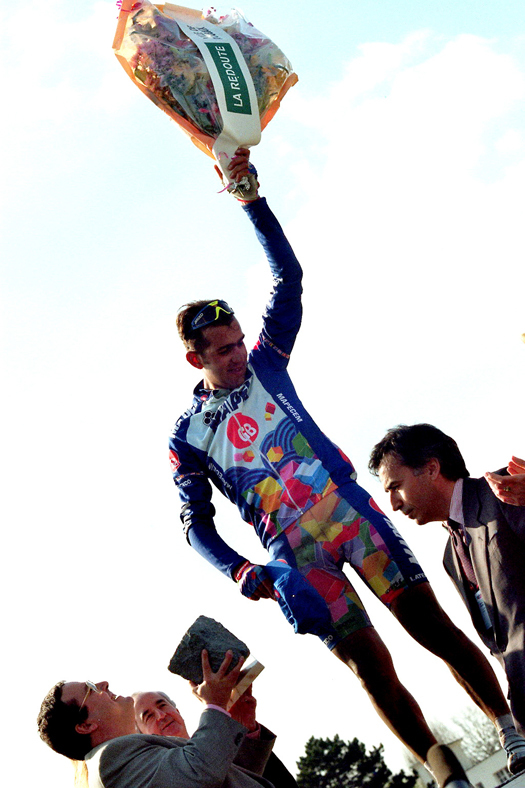 1997 was the ‘blip’ in Mapei’s run, with World Champion Museeuw suffering a number of punctures in the final 40km. 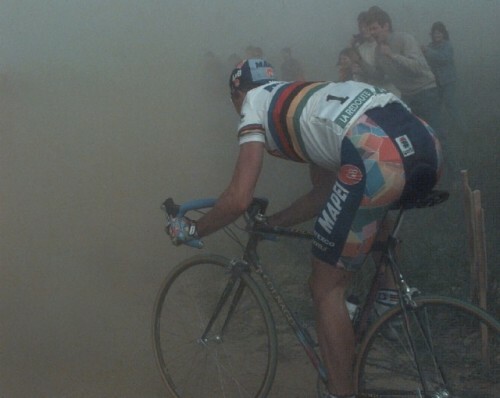 He still managed an impressive 3rd place after joining a chasing group to catch the breakaway, his rainbow jersey thundering over the pave a sight to behold in on particularly dusty day. 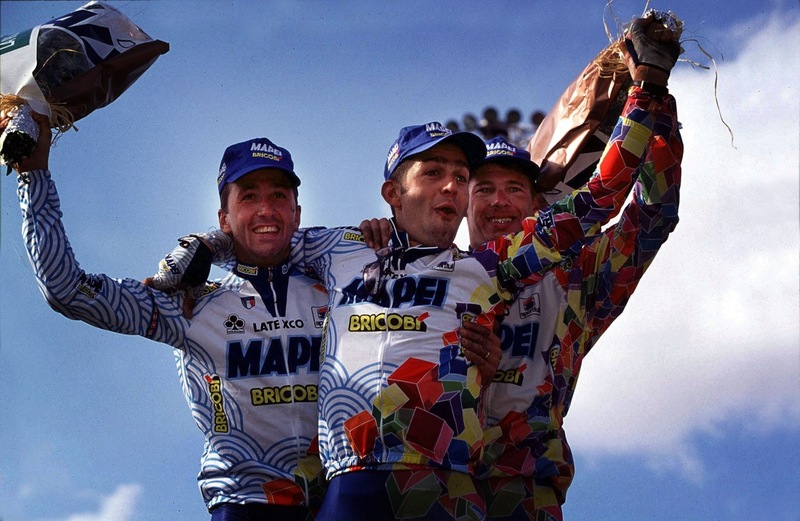 The ‘Mapei way’ of racing Roubaix came back in ’98 with Ballerini, Tafi and Wilfried Peeters taking all the steps of the podium. This time Ballerini was over 4 minutes ahead of his teammates having gone solo at 50km to go. It was a bittersweet victory for the team though, as news came through of Museeuw’s crash in the forest of Arenberg which hospitalized the ‘Lion of Flanders’ and was almost fatal. 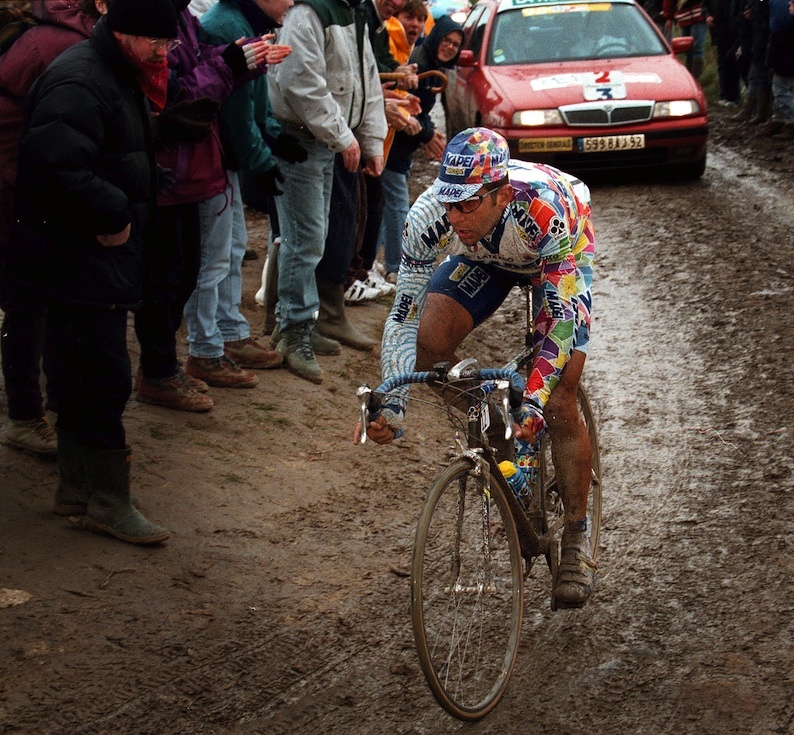 By ’99 Mapei’s way of racing classics was now well known but there was little the rest of the peloton could do about it. After joining the seven man break with team mates Peeters and Tom Steel, Andrea Tafi escaped in a cloud of dust and went solo with 29km to go. The Italian National Champion entered the velodrome over 2 minutes ahead of the rest and finally climbed to the top step of the podium having been 2nd & 3rd in previous years. His two team mates Peeters and Steel joined him on the podium in 2nd & 3rd. It was also a race to remember for Johan Museeuw who finished a respectable 9th, his confidence to continue racing boosted after his near death experience. 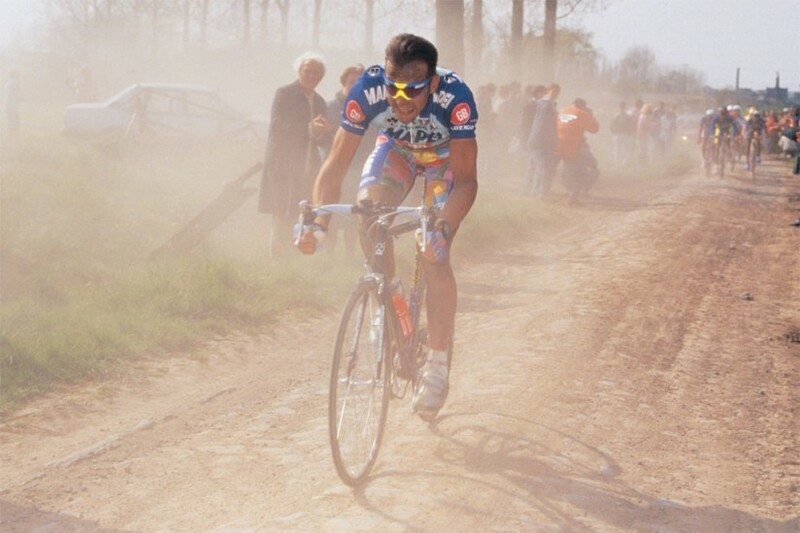 The next year saw Museeuw return to full form taking his second victory at Roubaix for Mapei. Strong winds marked the 2000 race with 66 DNFs in the peloton. Museeuw made a risky escape at 60km to go, riding through the gales completely unsheltered to cross the line just 15 seconds ahead of the others. As he finished he unclipped his left shoe and pointed at the scarred knee that could have cost him his life. 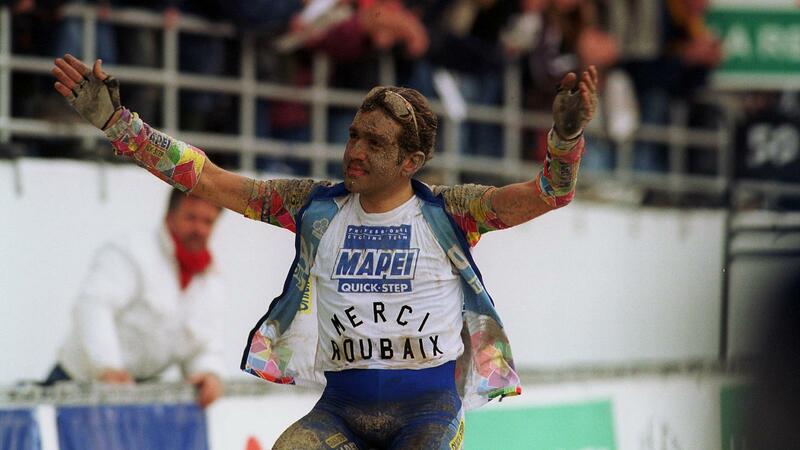 It was to be the last Roubaix win for Mapei but not their last ‘Roubaix moment’ – that came in 2001 when a mud spattered Franco Ballerini rode into the velodrome, down in 31st place, he unzipped his team jersey to reveal his white t-shirt printed with the words ‘Merci Roubaix’. At the finish line he saluted the fans and stepped off his bike and ended his career as a rider. His next achievements would be as Team Italia coach, leading Cipollini, Bettini and Ballan to World Championship and Olympic victories. The next time a Sportful jersey crossed the line first at Roubaix was on the shoulders of another classics legend, team Saxo Bank’s Fabian Cancellara. Having already won the Tour of Oman, E3 and Flanders at the start of the 2010 season, Cancellara, (who had started his career at Mapei) did a textbook ‘Mapei move’ and left his rivals behind with 50km to go, in the end crossing the line with more than 2 minutes to spare. 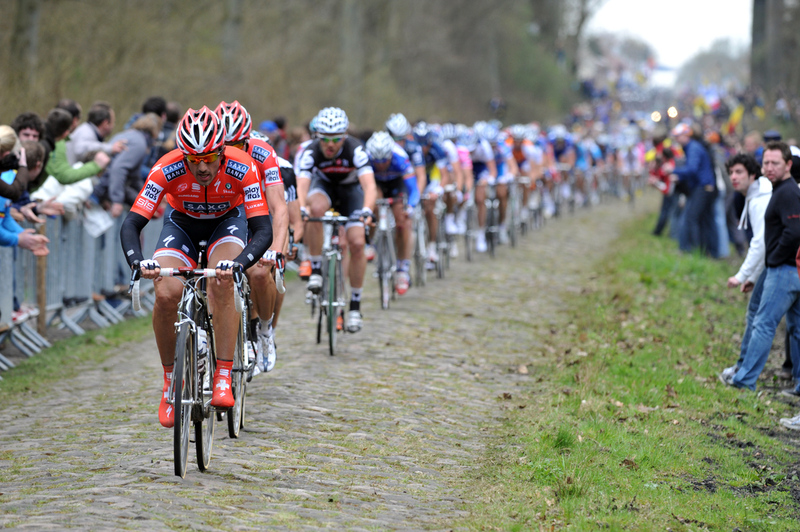 Like many Italians, Sportful has a fondness for the cobbled races of Northern Europe and our history with Roubaix makes it one of our absolute favourites and this year we have even more reason to be fixed to our screens watching the action. Make sure you don’t miss ‘The Hell of the North’! 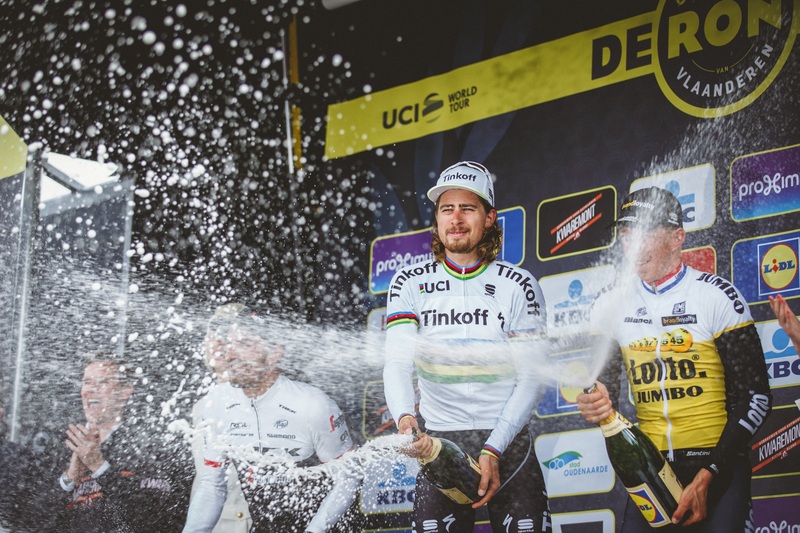 This entry was posted in Cycling and tagged arenberg, ballerini, bortolami, cancellara, carrefour, mapei, merci roubaix, museeuw, paris roubaix, pave, peeters, peter sagan, roubaix, sportful, tafi, tinkoff, tom steel. Bookmark the permalink.